This morning I got up early to take my Robot Car (aka: my 2004 Toyota Prius hybrid) to the mechanic, and as soon as I got home I went into my garage to work on my family’s 1930 Model A Ford. I love the contrast. 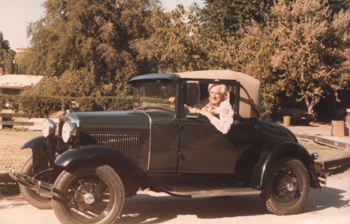 Here’s a picture of my Grandpa, Mac McBride, in the car in September of 1985, just after he got it restored. Today’s task was to finish taking off the radiator so I can get it professionally cleaned. Yesterday I got stopped by not being able to remove the hood by myself, but my friend Takeshi gave me a ride back from the mechanic and came over to help me out. It took about two seconds, but I was very glad I had help. The rest of it was pretty quick too. It would have taken longer except that when I got around to taking off the main bolts that hold the radiator on to the frame, I discovered that there weren’t any. Just two empty holes. For all these years the radiator wasn’t fully connected to the car! It had pipes and wires and supports on it so it wasn’t going to fall off or anything, but the main attachment bolts just weren’t there. I called my buddy BMX Bill (that’s just how I refer to him when he’s not around… I like it because it’s very descriptive… his real name is Bill Nitschke) and he hooked me up with his radiator guy who worked on my other BMX buddy Devin’s Model A radiator. I should be able to take mine in tomorrow. My other task for tomorrow is taking apart and cleaning the horn so that it will properly go AAAAWOOOOOGAAAAAA again. At the moment it’s got 20 years of gunk in it so it doesn’t make any noise at all. It’s really fun (and addictive) to work on cars. I can see why so many guys get so engrossed in it. I’m not even finished with this one yet and I already have ideas for what I want to do with the next one… or two…. Mark Hayward Is My Hero is powered by	WordPress 5.1.1 and delivered to you in 0.332 seconds using 39 queries.